A delicious Beef and Bean Skillet Taco Casserole that is amazing, and filling. 1 lb lean ground beef I like 93/7 to keep it healthy! Heat the oven to 350. In a medium pan cook ground beef until thoroughly cooked. Drain. Stir in salsa, taco seasoning, and refried beans, mix well and stir often. Place 2 cups of crushed chips into the bottom of prepared skillet. Cover evenly with beef mixture and top with bell pepper, onion, 1/2 can of diced tomatoes, and cheese. Place skillet in oven and bake for 20 minutes, or until cheese is melted. Top the casserole with remaining diced tomatoes, remaining tortilla chips, onion tops, and cheese. 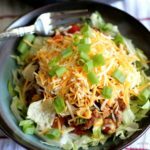 Place shredded lettuce in a bowl and top with Beef and Bean Taco Casserole. Oh my, yumminess! !